Who were the people that left Africa as slaves and migrants in past centuries? What were their names; what did they think and feel? Lubaina Himid is fascinated by these questions and makes us aware of them with her playful use of paint and everyday objects. Himid was born in Zanzibar, Tanzania, and came to the UK as a child. When she was starting out as an artist, she noticed that black people were not represented in the media or the arts. She became a member of the black arts movement of the 1980s, making paintings, wooden cut-outs and installations that explored black identity. At art school, she studied theatre design and there is a theatricality to the installations and projects she creates. Sometimes, her wooden cut-outs come off the gallery wall and stand on the floor, creating people from history who seem to walk among us. In 2017, Himid made history by becoming the first black woman, and the oldest artist, to receive the prestigious Turner Prize for contemporary art. My mother was a textile designer and so, because we looked at beautiful things in ships and in art museums when I was a child, the idea of being an artist was always a possibility in my mind. My favourite subject at school was English. I loved reading, talking and writing poetry, and my teacher was clever and encouraging. How do you go about making an artwork? I think a lot about impossible tasks and depicting difficult subjects or events. I make scruffy drawings on envelopes and scraps of paper. I experiment to find the right surface upon which to paint, this could be anything from wooden furniture to plates or canvas and paper. I read poetry and essays and look at picture books. Sometimes I talk to other artists about what I am trying to do. Then I start to work (almost always listening to music) but continually thinking, drawing, looking at books and talking all through the process. People’s resilience and their determination to make the world a better place. Where is your favourite place to see art? It’s exciting to see art in the artist’s studio and good to see it in people’s living and working spaces. However art galleries, when they are free, can be the most exciting places to really look long and hard at what the artist has achieved. I’m fond of Tate Britain because that’s where I went as a child and began to understand the way that painting could transform my life. I love the Serpentine Gallery because of its potential to be a place in which people can have a chance encounter with art as they stroll in the park. Being an artist is about working incredibly hard every day, and at the same time feeling free to do as you please with the ideas you develop and the materials you have. 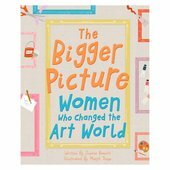 A colourful and insightful introduction to the lives of the world’s most renowned and inspirational artists.